C-Rod's English Classes: Post Your Pledge! Now that we have a new president, what is your pledge to this life? Remember, the road we travel is not just about us; it's about how we love and help others, too! Click on the link below to see pledges from the stars then begin to ponder on your pledge to a neighbor, the community, our school, our country or the world! What is your promise and pledge? Post it here, and let's make a difference together! I pledge to be a better mother, wife and teacher. I pledge to step up my efforts to assist special needs children through the Special Olympics, the Buddy Walk, and other organizations. I pledge to help the environment by recycling plastic and glass, and by reusing my plastic grocery bags and by purchasing and using environmentally-safe bags. I also pledge to help my students fulfill their pledges should they need my assistance. I pledge to be a better student, daughter, and athlete. I pledge to put the extra effort in achieving my goals, and fullfilling my dreams. I pledge that I will help the community by putting maximus effort in helping younger kids and assiting them when they need help. I pledge to help the enviorment by being eco friendly and recycling, and using less plastic. I pledge on going foward, and not letting anything get in my way of stopping me. Lastly I pledge to control my anger issues and learning how to loose. I pledge to be a better daughter, sister, friend, student and citizen. I pledge to help those who are need by assisting in local shelters and organizations. I pledge to be a good role model and example to everyone who surrounds me. I pledge to make this environment friendlier and cleaner. Most importantly, I pledge to fulfill all my goals and not let anyone's rude comments or let downs make me give up. I pledge to be a better student, to be a better person, and a bettor mentor for my siblings. I pledge to always find the good in everything, to see the good in all the bad. I pledge to be inspired by the negativity, so i could teach others to be positive. I also pledge to find the humor in everything. Lastly I pledge to not let anyone bring me down with their judgmental opinions and comments. I pledge to be a better person,student, and daughter. I pledge to achieve the goals that I want to accomplish in life.I pledge to not let things get to me so easily because its not that serious.I pledge to not get mad easily and always have a smile on my face. I pledge to help my mom more. I pledge to be more positve and not any negativity get in my way or stop me from doing something i like. Great pledges, Karina and Priscilla, but what are your pledges to the community or our world? My pledge to the community is that I can help by recycling, and re-using plastic bags. I also pledge to help younger kids not get bullied. Help them be stronger children. I pledge to be a better student , sister , and daughter and athlete. I pledge on fullfilling my dreams and not let no one put me down . I pledge to help people in need specially old people and childrens. I pledge to make this enviroment cleaner by recycling paper. I also pledge to see the good side of a bad thing. I pledge to be more understanding person, a better daughter,student, and sister. I pledge to be more studious as well as active in more clubs to "wow" the college that I prefer and to make my parents proud. I pledge to be conscious that my parents worry about me so that I will never lose their confidence or trust on me. I pledge to protect and support my younger brothers when ever they need my help and also push them to do well on school. I pledge to not waste so much water (=D lol I shower too long) and try my best to conserve electricity. And I pledge to myself to become more confident in myself and to diminish that shyness that keeps me away from expressing my true self. I pledge to me a better student, athlete, daughter, and citizen. I pledge to earn better grades, push myself harder in swimming and water polo, to help my mom around the house so she wouldn't have to do everything herself, and i pledge to do more community service and to recycle. To change all the light bulbs around the house, and to turn off lights that are no being used. Lastly, i pledge to be a better girlfriend, best friend and friend. To be there for others and help the ones in need. I pledge to be a better daughter granddaughter sister and aunt. I will be better by learning from my mistake, being sweeter and actually listening more and being more understandable. I'll my mom a lot more. I also pledge not let anything or anyone limit me from completying my goals that i want. I pledge to be the best i can be. I pledge to be a better student, friend and daughter. I pledge to work hard to get to my goal. I pledge to be helpful to others when they need me, give all my affection to my dear parents. To help the community by maintaining it clean and recycling things that can be reused. I pledge to be a better babysitter. I pledge to make my teacher's expectations of me true. And most importantly i pledge to remain loyal to myself. I pledge to be a better boyfriend, brother and son. I pledge to study more and get extraordinary grades. I pledge to be one of a kind, unique and be myself. I pledge to each moment that pass to be useful and have a reason to be alive. I pledge for happiness. I pledge to be a better brother to my younger syblings. I promise to forgive those who need it most. I pledge to always have a little fun. I pledge to do what i can to make this earth a better one by recycling and using ecofriendly fuel. I pledge to not let people get the best of me. I PLEDGE to keep writting comments in this blog until my fingers hurt. All are great pledges! Keep up the good work. Remember, however, you need to pledge to do something for your community, the greater good. You can do it. Even if you walk in your neighborhood once every two weeks and pick up bottles, cans and trash off the ground, that is a start. I believe in you all! Glad to see some of you back on the blog! I pledge to be a better athlete, student, and son. I pledge to never give up in anything i do. I pledge to go to church more often. I pledge to see the good things and not only the bad ones in everything. Also, I pledge to be a good role model for my little brother and cousins. Lastly, I pledge to never let anyone hold me back and just keep taking positive steps forward. i pledge to be a better student, daughter, friend, and swimmer. i pledge to do all i can to get my grades up. i pledge to achieve all my dreams and become successful in life.i pledge to understand people more. i pledge on working hard and lowering my times so i can someday meet mmicheal phelps. i pledge to help my community and environment. Great pledges. You should also pledge to capitalize the word "I." haha! I pledge to be a better brother, cousin, friend, and student. I pledge to help my family when help is needed. I pledge to assist every school day .I pledge to help the community in anyway that I can. And I also pledge to be a better human being. I pledge to be a better person every day of my life. I pledge to be a wonderful student the will always follow instructions and that will give the best of me. I pledge to be obedient and respectful. I pledge to take care of my family and friends, as well as myself. I also pledge to take care of the planet and nature. I pledge to remember that giving up is not a choice. i pledge to be a better person, student, and daughter. i plede to stop being so lazy and try my hardest in everything. i pledge to be alot nicer to others and not be so judgmental. i pledge to listen to my parents more and behave better. i pledge to not do bad things that can affect me and to always try to make the right choice. i pledge that ima b a better person in life..i pledge that ima do the best i could to not talk in class and not get in trouble..i pledge that im goin to reach my goal in the future which is to b SWAT like ur husband Ms...and finally i pledge to control my way to talk like no cursing ''THAT'' much.. I pledge to do better in school and try my hardest in putting more effort. I pledge to be a better daugther and student. I pledge to achieve my goals and to accomplish them. I also pledge to help other people in needs. Thanks for all the comments. Between pledges and contracts, you all are on your way to being the best you. The key is to follow through. YOU CAN DO IT! I pledge to always put my studies first and foremost, for they are very important. I pledge to dedicate more time to my brothers and sisters, to be a good example for them and to help them in anything. I pledge to help my parents in anyway that I can. I pledge to help my friends and anybody in need. I pledge to be a a better person, not only for the people around me, but for myself. I pledge to be a better student, friend, daughter, aunt, sister, and granddaughter. I pledge to refuse to dump garbage out of the window. I pledge to be an encouraging person towards everyone. I pledge to try and help fulfill my loveones needs or dreams. I pledge to help the community by assisting them in any shelter, hospital, or organization. I pledge to stride for higher because good isn't enough. I pledge to be the best role model the'll ever be. I pledge to stay above and never under, to begin and always finish. I pledge to sacrifice my needs. For example, cutting shower time, turning off everything when its not being used and lastly i pledge to stroll down nearby stores instead of driving. GREAT PLEDGE, CAROLINA! I am so proud of you! How is everyone doing with their pledges? I am struggling with the plastic bag one. I am still trying. I go to Publix and forget the cloth bags I have purchased. It's frustrating. I keep buying more, and I keep forgetting. haha! I am working on all of the others...and I want to be sure I go to mass every Sunday. I go most of them, but I need to go on ALL Sundays. I pledge to be a better student and daughter. I pledge to never give up, even when its tough. I also pledge to be a good role model to others and learn great things along with teaching them. 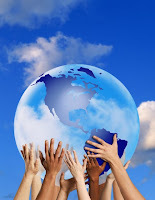 I pledge help improve our environment by picking after myself and others, along with recycling and saving electricity. I pledge to be a better son, student, athlete and role model. I pledge to help younger kids fullfill there dreams as much as I can. I also pledge to save electricity and not use plastic bags as much. These are my pledges in order to become a better person!